Bold leaders were never meant to maintain the status quo. Like progressive kings and queens that reign over a kingdom, leaders see the opportunities and challenges their kingdoms face and they want to make a difference. Often, Bold leaders are not satisfied with the status quo and find that it is no longer acceptable. This awareness might be from a looming crisis, a missed opportunity, a potential misfortune or serious threat. The awareness may come from observing that vitality and innovation need to be restored. Or, maybe inspiration comes from a glimpse of how things could be spectacularly better. Regardless of what sparked it, the leader has a feeling of unease about the status quo; a sense that all is not right and the leader awakens. Bold leaders challenge the status quo, breathe life into an inspirational vision of the future and energize the troops for the quest. This analogy can represent the Lean journey within many organizations. In a mythical quest, the hero returns with a prize that will resurrect vitality and renew the kingdom. We see this occur in the film Excalibur, when Sir Lancelot, a knight of the Round Table, brings the Holy Grail back to King Arthur. 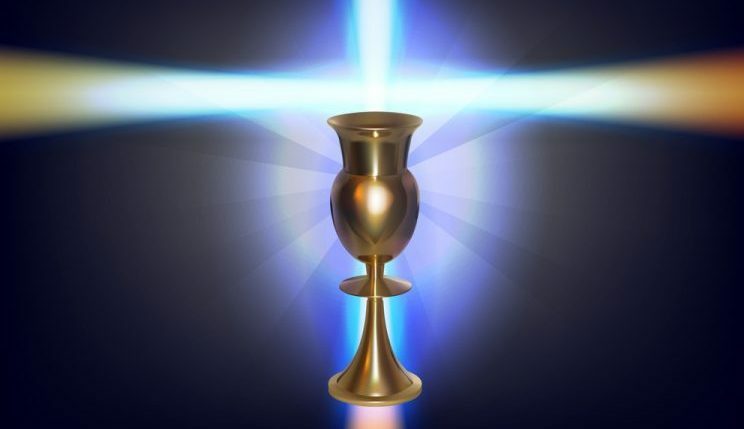 The Holy Grail is typically an object that is sought after for its great significance. It promises healing to a kingdom in danger of unraveling. In our world of today, that Holy Grail for Operational Excellence is Lean. Many leaders rely on Lean to transform their organization from the current state, to a vision of the future. Leaders have great aspirations, and we are inspired by those organizations that have been wildly successful with Lean. Those organizations are viewed as legendary and almost mythical. As a transformational leader along the Lean journey, you may find that the journey isn’t going as well as planned. You may say to yourself, “We have the Holy Grail. Why are my people not transforming?” You begin to wonder if the Holy Grail is a myth in itself. You have bestowed powerful tools like Value Stream Maps, continuous flow and kanban systems onto your people. You’ve granted authority to conduct Process Walks and Kaizen Events; Armed with fresh eyes to see waste and problems with flow. But alas, the magic is not taking hold. Where is the magic that you had envisioned? You want to believe that Lean culture is the answer, but you do not see it coming to fruition. This is a very typical situation. Many organizations have the Holy Grail in their grasp. Unfortunately, they haven’t quite figured out how to unlock the vast potential and wield all of the power and capability of the Holy Grail. It can’t just be front line staff and their immediate supervisors that are expected to change. In order for Lean to reach it’s full potential in organizations, leaders need to change too. This component is the missing link in most failed Lean Transformation efforts. In order for Lean Transformation to occur everyone in the organization must transform, including top leader. Not just a few employees in the ranks. The good news is that there are tried and true practices used by many leaders for building a Lean culture. This set of Lean Leader best practices is called Leader Standard Work. Leader Standard Work is a set of actions, tools and behaviors incorporated into the daily work of leaders. Leaders include all levels of formal leadership in an organization including Directors, Managers, Supervisors and Leads. The concept of “Standard Work” is ubiquitous in a Lean environment. It refers to the documented and current best way to do a certain task, procedure or process. Leader Standard Work follows this same idea. They are proven current best practices for leaders to drive transformational thinking and behavior throughout an organization. Using Leader Standard Work, leaders install and follow a management system to make processes and problems more visible, keeping improvement efforts at the forefront of worker’s focus. 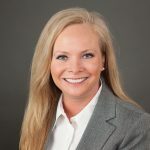 Of the hundreds of leadership development models that exist, The Five Practices of Exemplary Leadership stands out as a proven approach to shaping organizational cultures aligned with the guiding principles of Lean Management. In order for process improvement to flourish, leaders must embrace all of the Five Practices of Exemplary Leadership. Leaders should embrace the idea that every leader should be a coach and to commit to building the problem-solving muscle of their employees. Naturally, by integrating the Five Practices of Exemplary Leadership, Leaders will be emulating effective Lean Leadership. Process Performance Boards help make processes more visible. Most administrative processes are invisible. We can’t see them! The idea behind making processes visible, is that workers will focus more on the process rather than the people in the process. In a Lean organization, we want employees to focus on the process and improving it, not on the people that work in the process. 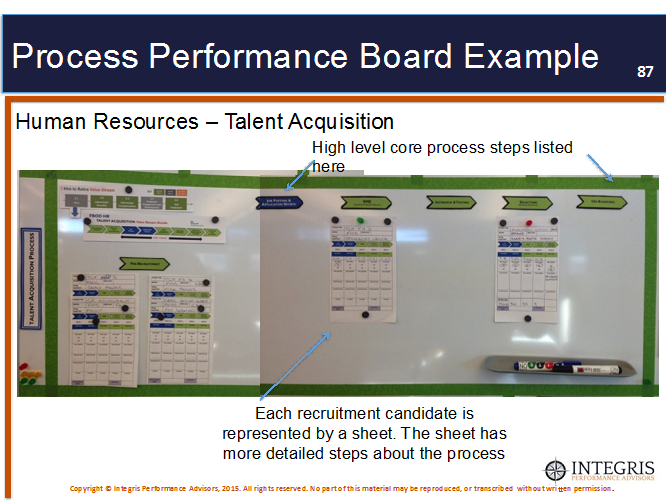 Below is an example of a Process Performance Board for the Human Resources Recruiting process. As a hiring manager, did you ever wonder, why things were taking so long to fill an open position? Or what part of the process was taking so long with your new recruit? This particular HR department decided to use Visual Management to communicate status to all interested parties. When someone has an status inquiry about a recruit, anyone could look at the board and know the status for the recruit. Another effective Lean Leader tool is a daily huddle meeting with direct reports that last about 15 minutes. Huddle meetings are also called Stand-Up meetings. Standing up during the meeting encourages attendees to adhere to the 15-minute maximum time. How did we do yesterday? Safety Incidents: Were there any and what will be done? Anything pop out to help identify a problem to focus on fixing today? What is the game plan for today? If leaders want their organization and their people to change, then Leaders must change first. Leaders need to inspire others in a shared vision and model the way. We have found that Leaders can help you drive the change in an your organization, or they can serve as the brake that prevents keeps the changes from happening. Leaders need to be actively engaged in creating the future. By starting with these three Leader Standard Work components organizational leaders will become more effective Lean Leaders and Lean transformation will start to take hold. For more information on becoming a Lean Leader, visit IntegrisPA.com and look at how we develop leaders and streamline operations.